We’re well into the second quarter of 2017 now, so if you haven’t had the time to get yourself along to any marketing events, this month leaves you no excuses with the great variety of upcoming marketing events and conferences for May 2017. We like to keep you updated on the most popular upcoming Marketing events around Australia each month. If you’re involved in, or know of any interesting Australian marketing or advertising industry events that you think rate a mention, please let us know. All you need to do is submit your event here. Big Digital Adelaide is back again in 2017! Over the two days you will learn different aspects of search engine optimisation (SEO), paid search, social media marketing, blogging and content development. Connect with speakers and attendees who are genuine experts. Whether you need to learn how to make over your site on a small budget, learn about WordPress security, understand keyword research, learn to write copy that converts, or connect with your brand in a way that moves customers as much as your employees, you have come to the right place. Do you want to expand on your Digital & Social Writing? If so, this event is for you. At this event you will be given different pieces web-based writing passages and will learn how to engage your target audience with it. Packaging is the first thing that a consumer sees, it creates perceptions about your company and this can have both a positive and negative influence. At this event you will her from Lisa Mathews who is an ex-marketer, brand strategist and Head of Frost* collective’s packaging design agency Jack, she will be speaking about her own experiences on how to achieve great packaging. Over the recent years marketing has changed so much, with different forms on technology and the way business is done. At this event you will learn key content planning and strategies to help promote customer engagement and how to implement this across your marketing campaigns. This event will be hands on and collaborative which will help develop ideas for your business. Along with 250 other B2B marketers, growth hackers and innovators you will learn what the latest is in B2B marketing and hear from some of the experts including Natalie Feehan, MYOB; John Clay, Arup Australasia; Sian Chadwick, American Express + many more. At this event you will be hearing from the CUstomer Engagement and Retention Marketing Manager from HBF, Allan Bryne. He will be taking you through HBF’s marketing automation story and their key learnings in the changing world of using an integrated marketing and automation platform. He will also be discussing their previous experience in the UK market around realising the value of martech. As we all know, the marketing industry is forever changing and at the moment Digital Transformation is the latest topic amongst the marketing industry. This event will bring together a suite of 3 panellists who have gone through digital transformation, they will be focusing on not for profits and charities. We will finish off this event with questions from the floor and the MC to quiz the panellists on the success and challenges they faced. There are many different forms of marketing, at this event you will be introduced to different concepts to effectively use digital forms of marketing; marketing is a crucial part of the overall marketing plan and it includes social media, e-marketing and the value of your current website. You will learn how digital marketing can apply to a variety of businesses. The marketing industry changes all the time, so in this workshop you will learn the art of story telling. Telling the story the correct way will engage your customers and clients with your business. When you brand perception increases you will see the engagement will also. This event is all will be focusing on the world of mobile tech, mobile trends and mobile marketing. Attending this event, will give you great insights into different ways you can leverage mobile-first marketing techniques. There will be 3 guest speakers on a panel and they will be discussing the changing media landscape, how to take mobile and customer insights and turn them into a tangible strategy plus much more! This is the 3rd annual Techmix conference and has a focus on customer reach, marketing performance and customer experience. There are both international and local speakers from all different industries and they will be presenting on different case studies, leading insights plus much more. Attending this event you will get the opportunity to network with your colleagues in the same industry, there has been a growth this year to more delegates in the marketing technologists, creative technologists, growth hackers, and digital strategists sectors – come and learn from them as well! In this workshop you will learn the art of story telling and how it is the key for all marketing departments regardless of the size of the company. Telling you company’s story in an authentic way will resonate with the customer, this is how referrals come your way, your brand perception will increase as well as the engagement. As this industry is for-ever changing, this workshop will take the time to introduce different concepts of effectively using the different digital platforms as part of your marketing plan. You will gain an understanding of the value of social media & e-marketing solutions. This event includes two days of research, insights, strategies, interactive workshops, roundtables and networking to help give brands the edge on millennial consumers. This in-depth event looks at reasons why things happen the way they do on social media and how you can maximise you efforts with limited resources.The speaker, Meg Coffey, will take be looking at how different social media platforms work and give you practical tips and tricks to help. This conference offers a range of content and brings speakers from diverse fields, who all have one objective in mind: To help you lead more effectively so as to meet the challenges of today’s global business environment. Organisations and individuals alike must reinvent themselves constantly; experiment and learn; identify new opportunities, exploit them fast, and move on. 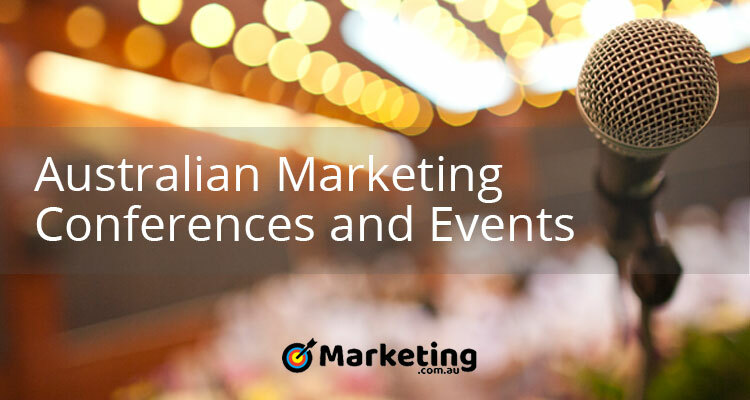 Take a look at some of the other great upcoming Australian Marketing Conferences and Events on the Marketing.com.au calendar.